Don't throw that aluminum can out when the last drop of your drink is gone. You can repurpose it easily into a customized keychain that boldly honors your favorite brand. Keep your keys organized, and add a touch of color to the set with this creative DIY project. 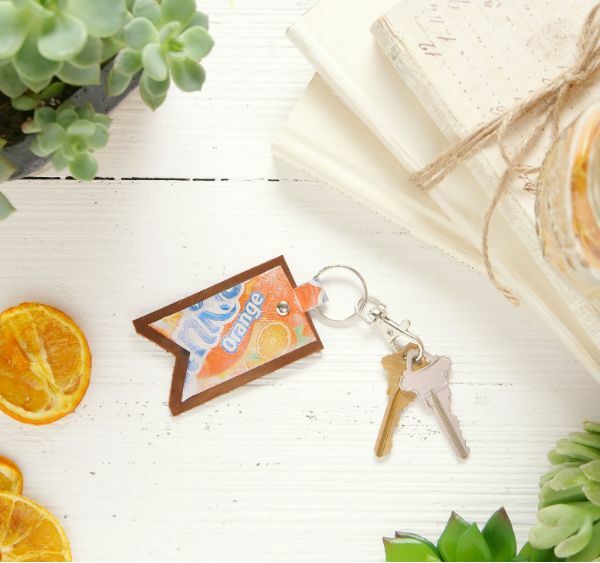 An X-Acto knife, ruler, hole punch and a few other easy-to-find craft supplies will help you transform an empty can into a personalized keychain. A soda can keychain makes a distinctive gift alone or combined with a variety of can labels. 1. Place the decorative scrapbook paper on a flat surface. 2. Use scissors to cut a single 1½-inch wide and 12-inch-long piece from the sheet. 3. Starting at the bottom left corner of the strip of paper, measure half an inch diagonally toward the center of the paper with a ruler. Mark the line with a pencil. Repeat, starting from the bottom right corner of the paper. Flip the strip of paper over, and repeat on the opposite end of the paper. 4. Following the pencil lines, cut out even triangles on both ends of the paper. 5. Fold the strip of paper in half, making sure the triangle points on both ends are in line before creasing. 6. Measure half an inch from the crease up toward the triangle points, and draw a line across the width of the paper. 7. Mark two even lines close to the crease that measure half an inch apart. 8. Cut away the outer squares on either side, leaving only the middle ½-inch square attached to the paper strip. Unfold the paper strip, and set it to the side. 9. Place a can lengthwise on a flat surface. 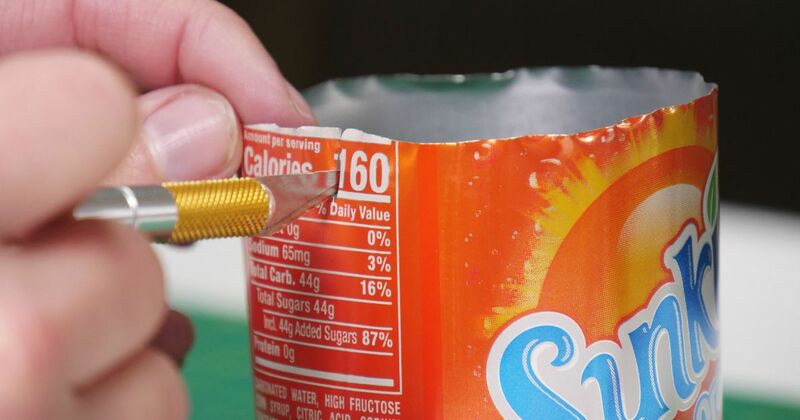 Cut away the top and bottom of the can at the rounded rim using an X-Acto knife. 10. Stand the can up. Cut down the length so you can unfold the aluminum and lay it flat. 11. Place two pieces of painting tape on the back of the aluminum. Press firmly to attach to a flat surface with the label facing up. 12. Place two pieces of painting tape on the back of the decorative paper strip. Firmly attach the paper strip to the top of the can label at a left diagonal. Make sure all of the edges lie on the aluminum. 13. Use an X-Acto knife to trace the edges of the paper, creating a stencil for the aluminum label. Use a ruler as a guiding edge for extra accuracy when cutting. 14. Remove the decorative paper strip from the label, and remove the label from the flat surface along with the painting tape. Carefully remove the stenciled shape from the aluminum rectangle. Place it on a flat surface. 15. Buff the colorful surface of the aluminum with a buffing block to create your desired look and texture. 16. Place one triangular side of the aluminum on top of the leather band, starting at the far-left edge. 17. Cut the leather band with a leather cutter to 3 inches in length. Ensure the rectangle of material extends beyond the triangular points of the aluminum. 18. Trace the triangle edges of the aluminum onto the leather from each diagonal edge. Cut the triangle out with an X-Acto knife. 19. Fold the aluminum at the top midpoint around the leather so that the triangle edges line up on both leather surfaces with points facing down. 20. Using the leather hole punch, make a hole through both the leather and aluminum just beneath the top square. 21. Remove the aluminum. Place the entire piece through the center of a keychain ring so the individual surfaces hang on either side of the ring. 22. Place the leather between the aluminum sides. Insert a pin through the hole at the top from the back, with the sharp end facing up from the front. 23. Place a flat pin backing on top of the pin, and align a metal dowel in the center of the backing. 24. Hammer the dowel carefully with the rubber-head hammer to secure the pin and keep the aluminum surface secured around the leather center. 25. Attach the key ring securely to a set of keys for daily use as a customized keychain. Enjoy your new keychain! Share on Facebook.